Aaron Yan (traditional Chinese: 炎亞綸; simplified Chinese: 炎亚纶; pinyin: Yán Yǎlún) is a Taiwanese singer, commercial model and actor. He is currently the youngest member of the boy band Fahrenheit. 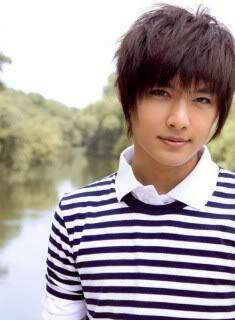 Wu Geng Lin (traditional Chinese: 吳庚霖; simplified Chinese: 吴庚霖; pinyin: Wú Gēnglín) was born on November 20, 1986 in Taiwan. At a young age, his family moved to New York, U.S., where he stayed for his primary school education for about five years. He then moved back to Taiwan for further education. He can speak and understand Mandarin, Hokkien, English and limited Japanese and Cantonese. He was a sophomore at Chinese Culture University, majoring in Journalism and News Broadcasting. However, because his career had greatly affected his academics and learning environment, he transferred to Jin Wen University of Science and Technology, majoring in English. Originally, Aaron was supposed to star in 翻滾吧!蛋炒飯 / Rolling Love along with fellow bandmate Jiro Wang, but he took the lead role in another drama, 霹靂MIT / Pi Li MIT / The Clue Collector, when the opportunity arose.